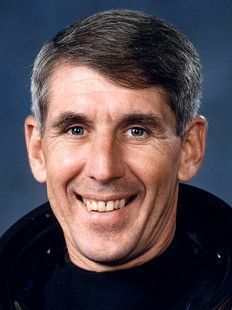 American test pilot mission specialist astronaut 1980-1990. US Marine Corps. Flew 550 combat missions in Southeast Asia. Grew up in Ashland, Ohio. Status: Inactive; Active 1980-1990. Born: 1942-05-21. Spaceflights: 2 . Total time in space: 9.90 days. Birth Place: Paterson, Missouri. PERSONAL DATA:� Springer was born on May 21, 1942, in St. Louis, Missouri, but considers Ashland, Ohio, to be his hometown.� He is married to the former Deborah Lee Horchler, and they have four children.� Springer stays active by participating in long-distance running, golf and kayaking. EDUCATION:� He graduated from Ashland High School, Ashland, Ohio, in 1960.� Springer continued his education and received a bachelor of science degree in naval science from the United States Naval Academy in 1964 and a master of science in operations research and systems analysis from the U. S. Naval Postgraduate School in 1971. ORGANIZATIONS:� When not involved with his family or pursuing a recreational activity, Springer is an active member of the Society of Experimental Test Pilots, the Marine Corps Aviation Association, and the United States Naval Academy Alumni Association.� He was also a member of the Operations Research Society and the Military Operations Research Society.� Springer was named one of the Jaycee's Outstanding Young Men in America in 1977. SPECIAL HONORS: While serving in the United States Marine Corps, Springer received the Defense Distinguished Service Medal, Legion of Merit, Navy Distinguished Flying Cross, Bronze Star, Navy Commendation Medal (second award), Navy Achievement Medal, NASA Space Flight Medal, Intelligence Achievement Medal, NASA Distinguished Service Medal, Combat Action Ribbon, Presidential Unit Citation, Navy Unit Citation and various Vietnam Campaign ribbons and service awards. EXPERIENCE:� Springer received a commission in the United States Marine Corps following graduation from Annapolis in 1964.� He attended the Marine Corps Basic School at Quantico, Virginia, before reporting to the Navy Air Training Command for flight training at Pensacola, Florida, and Beeville, Texas. Upon receiving his aviator wings in August 1966, he was assigned to VMFA-513 at the Marine Corps Air Station, Cherry Point, North Carolina, where he flew F-4 aircraft.� He was subsequently assigned to VMFA-115 at Chu Lai in the Republic of Vietnam, where he flew F-4s and completed 300 combat missions.� In June 1968, he served as an advisor to the Republic of Korea Military Corps in Vietnam and flew 250 combat missions in 01 ��Bird Dogs�� and UH-1 ��Huey�� helicopters.� When Springer returned to the United States later in 1968 to attend the U. S. Naval Postgraduate School in Monterey, California, and in March 1971, he reported to the Third Marine Aircraft Wing at El Toro, California and was assigned as wing operations analysis officer.� He flew UH-1E Huey helicopters in 1972 while with HML-267 at Camp Pendleton, California, and then went on to fly Huey helicopters with HML-367, First Marine Aircraft Wing, at Okinawa, Japan.� As an Aircraft Maintenance Officer with VMFA-451, Springer flew F-4 ��Phantoms�� and also attended the Navy Fighter Weapons School (Top Gun) while at Beaufort, South Carolina. A 1975 graduate of the U. S. Navy Test Pilot School at Patuxent River, Maryland, he served as head of the Ordnance Systems Branch and was a test pilot for more than 20 different types of fixed- and rotary-winged aircraft.� In this capacity, he performed the first flights in the AHIT helicopter.� He graduated from the Armed Forces Staff College in Norfolk, Virginia, in 1978 and was assigned to Headquarters Fleet Marine Force, Atlantic, where he assumed responsibility for Joint Operational Planning for Marine Forces in NATO and the Middle East.� He was serving as aide-de-camp for the commanding general, Fleet Marine Force, Atlantic, when advised of his selection by NASA. To date, Springer has logged more than 4,500 hours of flying time, including 3,500 hours in jet aircraft. Operations Center and the coordination of various aspects of the final development of the remote manipulator system for operational use as well as working in the Mission Control Center as orbit CAPCOM for seven flights in 1984 and 1985. Springer was responsible for Astronaut Office coordination of the Design Requirements Reviews (DRRs) and Design Certification Reviews (DCRs).� These review efforts encompassed the total recertification and reverification of the NSTS prior to STS-26 return to flight status. Twice flown, Springer has logged more than 237 hours in space.� He was a mission specialist on STS-29 in 1989 and STS-38 in 1990. In December 1990, Springer retired from NASA and the U.S. Marine Corps.� He is currently employed by The Boeing Company as director of quality systems, Integrated Defense Systems. SPACEFLIGHT EXPERIENCE:� STS-29 Discovery (March 13 to March 18, 1989) was launched from Kennedy Space Center in Florida.� During 80 orbits of the Earth on this highly successful 5-day mission, the crew deployed a tracking and data relay satellite and performed numerous secondary experiments, including a space station heat pipe radiator experiment, two student experiments, a protein crystal growth experiment and a chromosome and plant cell division experiment.� In addition, the crew took more than 4,000 photographs of the Earth using several types of cameras, including the IMAX 70mm movie camera.� Mission duration was 119 hours and concluded with a landing at Edwards Air Force Base in California. STS-38 Atlantis (November 15 to November 20, 1990) was launched at night from Kennedy Space Center.� During the 5-day mission, the crew conducted Department of Defense operations.� After 80 orbits of the Earth, in the first shuttle recovery in Florida since 1985, Space Shuttle Atlantis and her crew landed back at Kennedy Space Center.� In completing his second mission, Springer logged more than 237 hours in space. Although born in St. Louis, he considers Ashland, Ohio, his hometown. Springer is a member of the astronaut class of 1980 and at 46, he made his first space flight on STS-29 as mission specialist two (MS-2). He has worked in the Mission Control Center as a CAPCOM for seven flights and was responsible for Astronaut Office coordination of design requirements reviews and design certification reviews, part of the total recertification and reverification of the National Space Transportation System prior to STS-26's return to flight. Springer earned a B.S. degree in naval science from the U.S. Naval Academy in 1964 and a M.S. in operations research and systems analysis from the U.S. Naval Postgraduate School in 1971. After receiving a USMC commission, Springer received his aviator wings in August 1966 and was assigned to VMFA-513 at the Marine Corps Air Station in Cherry Point, N.C., where he flew F-4 aircraft. He then served in Southeast Asia where he flew F-4s and completed 300 combat missions. In June 1968, Springer served as an advisor to the Republic of Korea Marine Corps in Vietnam and flew 250 combat missions in 01 "Bird Dogs" and UH1 "Huey" helicopters. Springer attended Navy Fighter Weapons School (Top Gun) and in 1975 graduated from the U.S. Navy Test Pilot School in Patuxent River, Md. He has served as a test pilot for more than 20 different fixed- and rotary-wing aircraft and performed the first flights in the AHIT helicopter. Springer has logged more than 3,500 hours flying time, including 3,000 hours in jet aircraft. Family: Astronaut. Country: USA. Flights: STS-61-H, STS-29, STS-38. Projects: STS. Agency: USMC. Bibliography: 12, 6054. 1942 May 21 - . Birth of Robert Clyde 'Bob' Springer - . Nation: USA. Related Persons: Springer. American test pilot mission specialist astronaut 1980-1990. US Marine Corps. Flew 550 combat missions in Southeast Asia. Grew up in Ashland, Ohio. 2 spaceflights, 9.9 days in space. 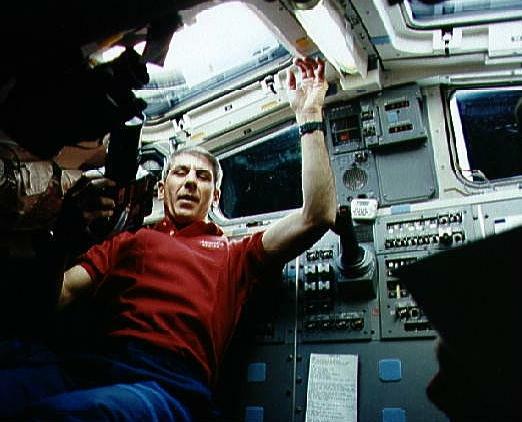 Flew to orbit on STS-29 (1989), STS-38..